So, you want to be a Voodoo Queen? It's a tricky job. You've got to be strong. There are other difficult jobs out there, sure. But when you're waitressing in a busy restaurant or you're working in a busy hospital you're simply dealing with boring human trifles. When you're a Voodoo Queen then you're working with the spirits in the afterlife. Now, those are some interesting coworkers. They don't take sick days, they don't take excuses, and they don't need lunch breaks. We're not sure if there's a Voodoo college out there. If there is we're sure you can get in. You're smart. You're with it. You can keep a beat. In the meantime, you can always dress for the job you want. When you're sporting this smart poncho, people will know of your magic aspirations. Who knows, you might even get recruited by the Voodoo community. With the rugged hemline and the cool, printed pattern you'll look powerful no matter what! The poncho with its off-white bone print is an easy yet eye-catching look. You can layer shirts underneath on chilly October nights. For a fancy twist, pair it with a pencil skirt and high heels if you want to take the poncho in a casual direction simply pair it with black jeans. 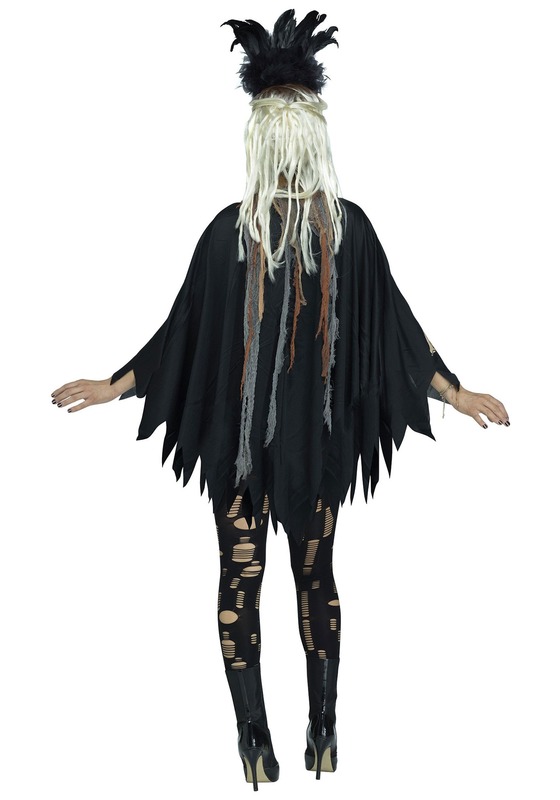 Now, when you're ready to ramp up your spooky look on Halloween night you'll look awesome with one of our voodoo wigs and a Voodoo skull staff. Want to escape boring human trifles and become a Voodoo Queen? It's all about the look!